One of the keys to successful duck hunting is finishing birds in close and a huge element of that is your decoy spread. There are all forms of configurations that work but you need two factors above all others to be effective. Those factors are realism and diversity. GHG Pro-Grade decoys offer both with ultra-realistic carvings and paint schemes and multiple versions and species. 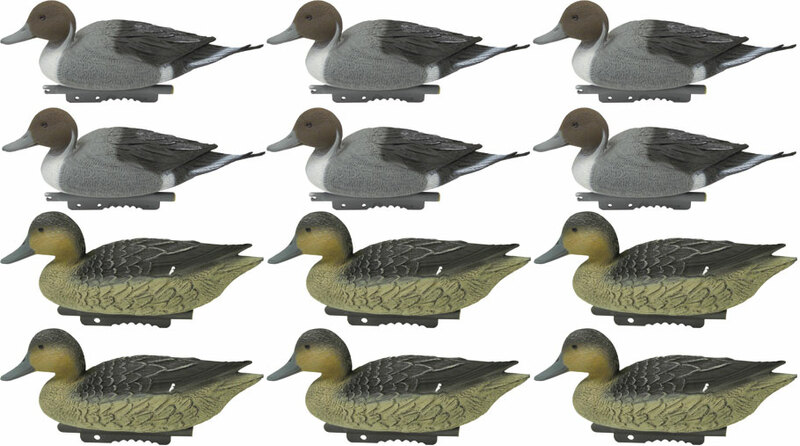 GHG is proud to introduce fully-flocked pintail decoys to the Pro-Grade line. These are the ultimate decoys, flocked to eliminate decoy glare and replicate exact feather detail. Size: Drake 19.5", Hen 15"
The Big Foot Pintail Floater Decoys feature a sleek body design that prevents tangled lines so you spend less time messing with your set and more time hunting. A durable one-piece polyethylene construction eliminates the frustration of missing decoy pieces. Includes 4 Upright Drakes and 2 Resting Hens per six pack. Avian-X presents their newest series of true, custom-style painted Pintail decoys. If you are looking for the best Pintails on the market, look no further. The incredible realism and paint schemes make these decoys a work of art. Couple that with the advanced rubberized molding material and non-chip paint and you have the best of the best. The Avian-X Topflight Pintails are available in 6 packs that include 4 drakes (2 feeders and 2 low-heads) and 2 low-head hens. All Topflight Series decoys feature the innovative weight-forward swim keel design; simply snap the line through the swim clip creating a natural motion to the decoys, whether in current or in the slightest breeze. Decoys are slightly over-sized measuring 17" breast to tail. 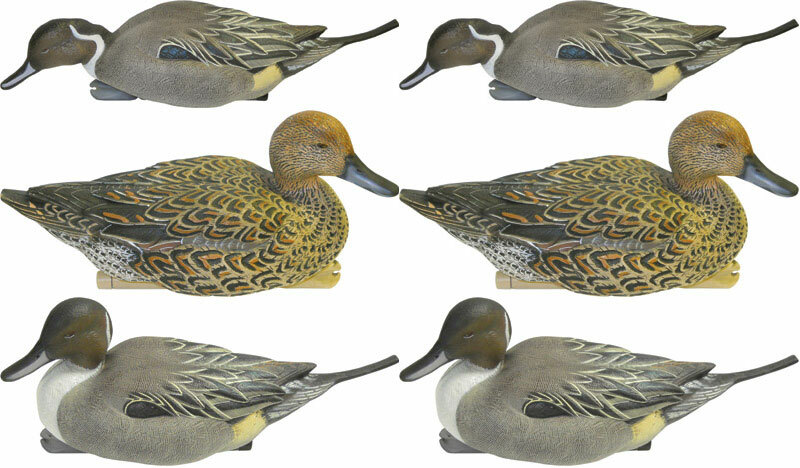 Designed by award winning master carver Don Mintz, these decoys feature detailed texturing and color shadings that set them apart from other decoy manufacturers. 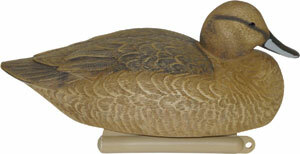 Each decoy has a lifelike migration plumage using specific colors in conjunction with the carving’s natural feather shading. 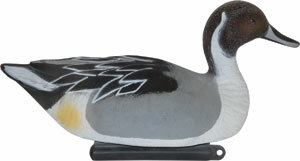 The durability of these pintail decoys will provide many years of assured field performance. Finally the keel design guarantees upright stability and allows the decoy to naturally swim in the water. • Size: Drakes 17.75", Hens 15.75"
The Northern Pintail is one of the most revered and majestic ducks in waterfowl hunting. 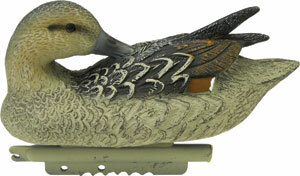 These magnum sized Pintail have a visible white color and, Upright Hens 16.75"
• 6 Pack includes: 4 Drakes (1 Sleeper, 3 Upright) and 2 Upright Hens5"
Created by Master Carver, Don Mintz, this collection is lifelike and spot on in posture and paint schemes. Magnum size. Weighted keel. These Standard Weighted Keel Sport-Plast Pintails measure 16 1/2" from the breast to tail tip for the drakes and the hens measure 13 1/2" from breast to tail. These high quality decoys are packaged 6 drakes and 6 hens per dozen. Designed to combine quality with a very economic price. Now, even better than before, these decoys come a redesigned keel to make it easier to wrap anchor cord and make storage easier. 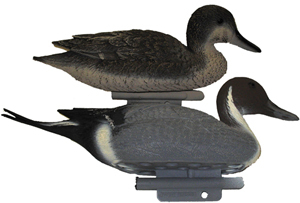 These pintails have a vacuum bottom that provides for a more stable decoy. 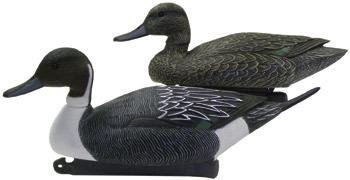 These Super Magnum Pintail Drake decoys feature realistic body detail and raised feathers. The decoy is molded of a high impact plastic that not only makes it lightweight but also durable. Custom made in the U.S.A. the decoy has a specially treated surface for maximum paint adhesion and longevity and also a non-glare paint formula. The decoy has a unique keel design with front and rear tie offs and is weighted with counter balance to guarantee self-righting. Using a hand carved pattern. 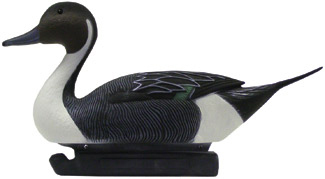 These life-like Standard Pintail decoys were designed with features including a detailed attention to a realistic body, details and raised feathers. The decoy is molded of a high impact plastic that not only makes it lightweight but also durable. Custom made in the the U.S.A. the decoy has a specially treated surface for maximum paint adhesion and longevity and also a non-glare paint formula. The decoy has a unique keel design with front and rear tie offs and is weighted with counter balance to guarantee self-righting. Length: Hen 17" Drake 20"
These life-like Oversized Pintail Drake decoys were designed with features including a detailed attention to a realistic body, details and raised feathers.